According to a 2005 study conducted using national nutrition survey data from 1999 to 2000, 68 percent of Americans consumed less than the recommended dietary allowance of this essential mineral. Deficiency has been associated with 100 conditions and symptoms. Some of these conditions include constipation, insomnia, attention deficit disorder, anxiety, high blood pressure, obesity, osteoporosis, fibromyalgia, Type 2 diabetes, premenstrual syndrome, cardiovascular disease, migraines and premature aging. These are all very common complaints among Americans. If this was the case 15 years ago, can you imagine the deficiency today? Yikes! 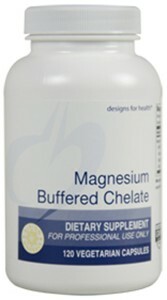 At K6 Wellness Center, we recommend Magnesium Buffered Chelate, by Designs For Health. While there are many forms of Magnesium, we find that most people absorb and benefit from the buffered chelate form of Mg. Why? When minerals such as magnesium are chelated, they are more likely to survive the passage from the stomach to the small intestines intact. Because of this, more mineral from the chelated variety will be absorbed in the intestinal tract than magnesium that is not chelated. Magnesium Buffered Chelate is one of the best absorbed forms of magnesium. Each capsule provides 150 mg of elemental magnesium. This product should not cause any of the unfavorable gastrointestinal symptoms associated with magnesium supplementation due to the very stable chelate formed between two glycine molecules and each magnesium ion via a patented process. This product is typically considered ideal for those who are trying to correct a magnesium deficiency.